Physical characteristics: The small buttonquail is 5.9 to 6.3 inches (15 to 16 centimeters) in length and 1.4 to 1.9 ounces (39 to 54 grams) in weight. It is chestnut in color with a reddish breast and shoulders and a slender blue-gray bill. The female is somewhat larger and more brightly colored than the male. 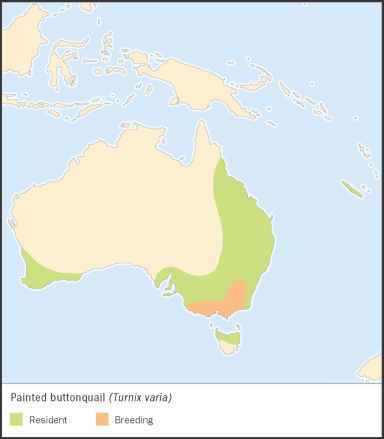 Geographic range: The small buttonquail is found in southwestern Spain and northern Africa, in sub-Saharan Africa, in southern and Southeast Asia, in the Philippines, and in Indonesia. Habitat: The small buttonquail inhabits grassland, farmland, and scrub areas. Diet: The small buttonquail tends to be primarily insectivorous, that is, eating insects and other invertebrates. It also eats seeds. or active at night. The small buttonquail breeds year-round during the rainy season in all parts of its range except Europe, where breeding occurs only in spring and summer. Females are sequentially polyandrous (the female mates with one male, leaves him a clutch of eggs to tend, and then mates with another male, repeating the process throughout the breeding season). 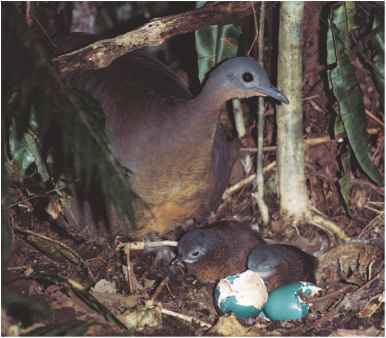 Usually four eggs are laid at a time by the female and hatch after twelve to fifteen days. Chicks can fly by seven to eleven days old and become independent at eighteen to twenty days. Small buttonquails and people: The small buttonquail is hunted for food throughout its range except in Europe, where it used to be hunted. The small buttonquail is also raised for food.